The large master suite is located on the first floor and comprises of a king size bed dressed in fresh white linens and a retro style seating area. It has a dressing room and an extensive ensuite with a large bathtub and a rainfall shower. From here, there is easy access to a private balcony for a quiet morning coffee before the adventures of the day begin. 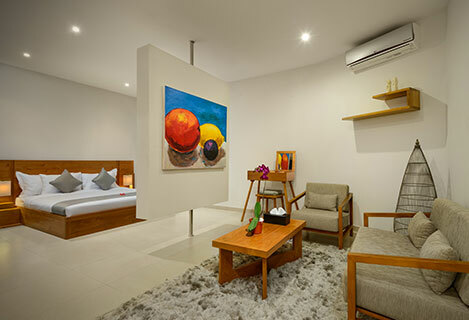 The further two bedrooms are both spacious and decked out with king size beds. These are both on the ground floor and reached by large glass doors from the garden, affording them exquisite views over the garden oasis. The media room can also be converted into a further bedroom and has access to its own private ensuite with a shower. 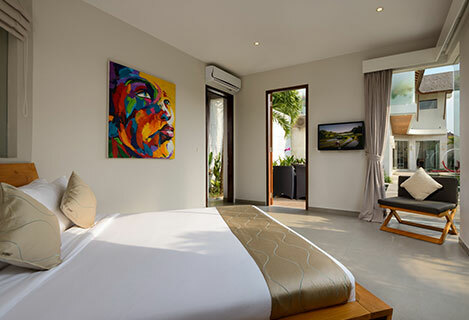 All the bedrooms are fully air-conditioned, have bright flourishes of modern island art and are equipped with Satellite TV and DVD players. Built in a curving L shape around an iridescent swimming pool which fluidly echoes the shape of the building, this property offers abundant opportunities to enjoy the great outdoors. A series of traditional cushioned loungers provide a superb spot for kicking back and recharging your batteries in the sun and an unusual circular double lounger forms a striking centre piece at the top of the pool, right beside the bubbling beauty of the Jacuzzi. Or if you prefer the shade, a gorgeous covered day bed brimming with scatter cushions, nestles invitingly in one corner framed by the splendour of the exotic planting. Dining alfresco is one of the unconditional pleasures of any island experience and this luxury villa offers not one but two flawless spaces. 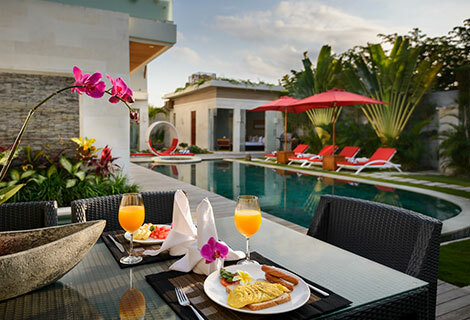 One of these is provided by a rattan dining set on the elegant wooden decking beside the swimming pool. Here, you can settle back and enjoy the succulent dishes produced on the BBQ while the sun sets on another day of perfect relaxation and the other more intimate option is granted by a secluded balcony, with spectacular views and lavish window boxes, on the first floor. 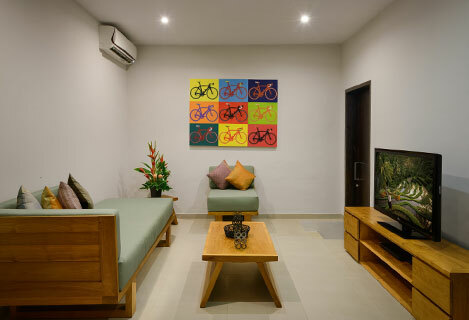 Inside, the villa is air-conditioned throughout and your every comfort is catered to with the same precision as the garden area. The main living accommodation is open plan and nestles in the curve of the L shape. 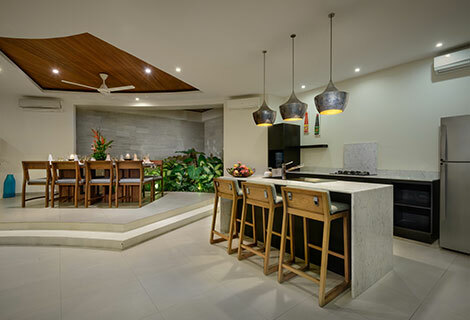 It features a fully equipped modern kitchen with Modena appliances and a breakfast bar, a chic formal dining table and a stylish black corner sofa. Minimally furnished with snaps of modern art and colour, this is a great place to hang out in the cool and just enjoy each other’s company. 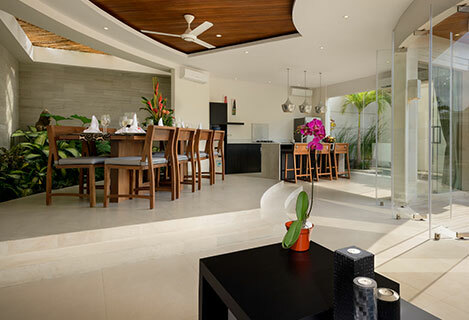 Surrounded by glass patio doors with safety features, the glow of the tropical outdoors is never far from the eye. A separate media room is fully kitted out with Satellite TV and a DVD player and if need be, can be converted into a further bedroom complete with ensuite. This appealing and well maintained villa is staffed by a personal butler service, daily housekeeping, a pool attendant and a gardener. A villa manger is on call and can provide a full range of concierge services and assist with any requests, questions or problems you may have. Furthermore, a maintenance team are on standby, just in case of any issues. Additionally, for your safety and peace of mind a night time security service is on duty between 10pm and 6am. Extra services such as day trips and additional staff including a chef (2 days’ notice is required) can be arranged for an extra charge.